SimCity BuildIt 1.5.7.31127 APK is coming to Android so for you who like simulation game you can download the latest version and install it easily to your device. You will act as a governor whose job is to build a city. To meet these objectives, you should begin to build all the infrastructure that vacant land be filled with residents and the complete city. The first step you should do is to build a factory in order to produce iron or wood used to build housing. Before we go too far, there is one rule that must be fulfilled that is all that you have to stick. So before you act to realize the city you dream, do not forget to build a road first. Fortunately this way can free you wake up with a way swipe on the screen to form the path you want. Being a governor in charge of the city is not as easy as you think. 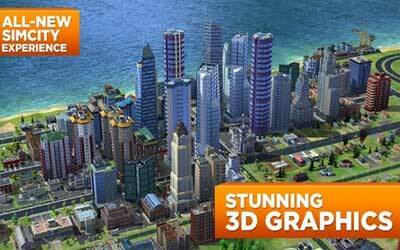 Very many matters that should you finish in SimCity BuildIt that people do not get angry. After the housing so and started a lot of people who live in the city, you must provide their basic needs such as electricity, water, fire, parks, sewage treatment, and many more. To meet all these needs, of course, you need money that is not little. Then how to earn money? Relax, there are a lot of ways. Upgrade the housing so that even greater. Another way could be to sell the resulting plant to other players such as metal, wood, plastic, and others. Or the last way that the citizens of the tax paid to you. This tax could you take each day, and the mechanism is quite interesting. Made some behind-the-scenes enhancements, including improvements to messaging and more, to make your city-building experience better. Easy to get addicted with this game, just same as the desktop edition. Would be great if we can reset our city to beginning again, just same like the desktop edition.